Pollack received his PhD in biomedical engineering from the University of Pennsylvania in 1968. He then joined the University of Washington faculty and is now professor of Bioengineering. His interests have ranged broadly, from biological motion and cell biology to the interaction of biological surfaces with aqueous solutions. His 1990 book, Muscles and Molecules: Uncovering the Principles of Biological Motion, won an "Excellence Award" from the Society for Technical Communication; his more recent book, Cells, Gels and the Engines of Life, won that Society's "Distinguished Award." Pollack received an honorary doctorate in 2002 from Ural State University in Ekaterinburg, Russia, and was more recently named an Honorary Professor of the Russian Academy of Sciences. He received the Biomedical Engineering Society's Distinguished Lecturer Award in 2002. In 2008, he was the faculty member selected by the University of Washington faculty to receive their highest annual distinction: the Faculty Lecturer Award. Pollack is a Founding Fellow of the American Institute of Medical and Biological Engineering and a Fellow of both the American Heart Association and the Biomedical Engineering Society. He is also Founding Editor-in-Chief of the journal, WATER, and has recently received an NIH Transformative R01 Award. 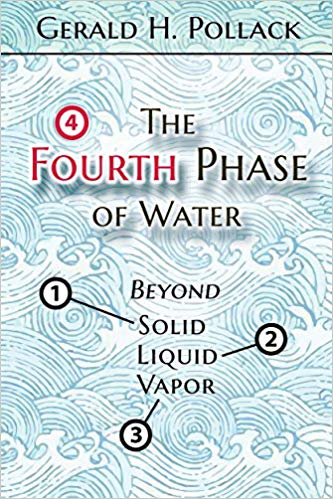 He was the 2012 recipient of the Prigogine Medal and in 2013 published his new book: The Fourth Phase of Water: Beyond Solid, Liquid, and Vapor. The Pollack laboratory centers largely on the identification of water’s fourth phase, otherwise known as exclusion-zone water. EZ water has many applications in nature and technology. Among the natural applications, the lab lays special emphasis on the role of EZ water in health, including cell biology. There is also an historical emphasis on biological motion and the origin of life. Further, several technologies have emerged from the fundamental discoveries made in the laboratory, and a spinoff company called 4th-Phase, Inc., has been formed to pursue those technologies. Below you will find summaries of the major themes of the Lab. EZ Water: Water has three phases – gas, liquid, and solid; but findings from our laboratory imply the presence of a surprisingly extensive fourth phase that occurs at interfaces. The formal name for this fourth phase is exclusion-zone water, aka EZ water. This finding may have profound implication for chemistry, physics, and biology. The impact of surfaces on the contiguous aqueous phase is generally thought to extend no more than a few water-molecule layers. We find, however, that colloidal and molecular solutes are profoundly excluded from the vicinity of hydrophilic surfaces, to distances up to several hundred micrometers. Such large zones of exclusion have been observed next to many different hydrophilic surfaces, and many diverse solutes are excluded. Hence, the exclusion phenomenon appears to be quite general. To test whether the physical properties of the exclusion zone differ from those of bulk water, multiple methods have been applied. NMR, infrared, and birefringence imaging, as well as measurements of electrical potential, viscosity, and UV-VIS and infrared-absorption spectra, collectively reveal that the solute-free zone is a physically distinct, ordered phase of water. It is much like a liquid crystal. It can co-exist essentially indefinitely with the contiguous solute-containing phase. Indeed, this unexpectedly extensive zone may be a candidate for the long-postulated “fourth phase” of water considered by earlier scientists. The energy responsible for building this charged, low entropy zone comes from light. We found that incident radiant energy including UV, visible, and near-infrared wavelengths induce exclusion-zone growth in a spectrally sensitive manner. IR is particularly effective. Five-minute exposure to radiation at 3.1 µm (corresponding to OH stretch) causes an exclusion-zone-width increase of up to three times. Apparently, incident photons cause some change in bulk water that predisposes constituent molecules to reorganize and build the charged, ordered exclusion zone. How this occurs is under study. Photons from ordinary sunlight, then, may have an unexpectedly powerful effect that goes beyond mere heating. It may be that solar energy builds order and separates charge between the near-surface exclusion zone and the bulk water beyond — the separation effectively creating a battery. This light-induced charge separation resembles the first step of photosynthesis. Indeed, this light-induced action would seem relevant not only for photosynthetic processes, but also for all realms of nature involving water and interfaces. The work outlined above was selected in the first cohort of NIH Transformative R01 awards, which allowed deeper and broader exploration. It was also selected as recipient the 2008 University of Washington Annual Lectureship. Each year, out of the University’s 3,800 faculty members, one is chosen to receive this award. Viewable here, the lecture presents the material in a lively manner, accessible to non-experts. The material now appears in a book, published 2013, entitled The Fourth Phase of Water: Beyond Solid, Liquid and Vapor. Sample chapters are freely accessible at www.ebnerandsons.com, which also contains published reviews. Reader reviews can be found on Amazon.com. Many lectures and interviews on the material above can be found on the internet. Of interest are two TEDx talks. The original one presents an outline of the basic discoveries, designed for a lay audience. The second one, 2016, describes the relevance of EZ water for health. Also of interest may be a short Discovery Channel piece that combines fourth phase water with snowboarding.